Trim the crust of the bread . Put one scoop of ice cream on a bread slice ,cover with another bread slice, roll it into a ball. Once it's completely covered freeze it for 2 hours. Heat oil in pan, drop the balls one at a time . Fry them carefully for few minutes. Usually I do not learn post on blogs, however I wish to say that this write-up very pressured me to try and do so! 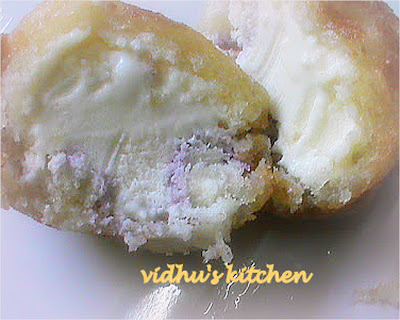 i alwayz think hw to fry icecream..
i doubt, hw to roll the bread icecream sandwich to a ball?? This is a very innovative recipe..kids delight ! What a wonderful pics of fried ice cream you have here. A very nice blog! loved ur fried ice cream too! Very interesting n unique recipe, sounds so yummy. totally different idea from our fried ice cream... loved it... happy to follow you too.. Very innovative recipe...keep it up..
Omg, wish to have rite now..loving it. Yummilicious icecream.. U have a wonderful blog.